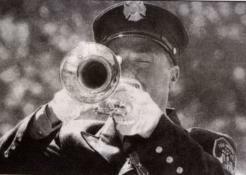 During the weeks and months which have followed the terrible tragedy of September 11th, 2001, Julius Pontecorvo, Official Bugler of the New York City Fire Department, has had the somber duty and privilege to perform “Taps” for many FDNY funerals and memorial services. At churches, cathedrals, and synagogues throughout the New York City Metropolitan area, this lone bugler’s clear, focused, and resonant tone has given voice to an unspeakable grief. For many years Julius has been active as a professional trumpeter in addition to his duties with the fire department. As the leader of a club-date band, “Nightmoves,” he books and works an average of 100 dates a year. So he knew he would do a good job when it really counted the most. But nothing in his prior experience could fully prepare him for the intense emotional toll which this crisis would inflict on him. Through it all, however, he has pressed on and provided an important service for the families of these fallen heroes, as well as for the thousands of other firefighters who have come to the many ceremonies from all over the United States and even the world, to show their respect. Julius Pontecorvo, age 48, has been a New York City Firefighter since April 7, 1979. He began studying trumpet with his father, Daniel Pontecorvo, then a NYC Firefighter and Bugler (now retired), who was himself a very accomplished big-band style trumpeter for many years – even leading his own group under his stage name of Sunny Daniels. After graduating from New Utrecht High School (Brooklyn), and then getting his Bachelor of Arts Degree in Music Education from Long Island University (Brooklyn), Julius went on to play lead trumpet with many latin bands throughout New York City, including lengthy gigs with Tito Puente’s band, as well as a stint with Lionel Hampton. Then, as can so easily happen to trumpet players who are constantly called on to play loud and high, night after night, he suffered a major embouchure breakdown. The severe fiscal crisis in the city during the 1970’s resulted in what has been described as a near total dismantling of instrumental music programs in the New York City Public Schools. Even with his Music Education degree and State Teacher Certification, there simply were no teaching jobs to be had. So, for the next two years Julius went into the practice room to get his chops back; first an hour or so, then gradually up to 8 to 10 hours of practice a day. With the extraordinary gift of total family support, he was able to completely devote himself to rebuilding and strengthening his playing, while learning how to use his air more efficiently in conjunction with a more relaxed and balanced embouchure setup. One day, in early 1979, he got a call to do a road gig with a disco band which would be traveling all over the United States. He jumped at the opportunity. Playing six nights a week his chops got better and better. Several months later the band arrived in Las Vegas for an extended engagement. Several weeks later, April 1st, he got a call from his Dad back in New York. This call was to change his life; in a way that would profoundly affect and influence the lives of thousands of others some 23 years later. Julius had taken the Firefighter test some months earlier; mainly as a backup. He did very well, scoring high on both the physical and written portions of the exam, and his name had been placed on a waiting list. Being out on the road, and playing every night, had pretty much put all thoughts of becoming a firefighter out of his mind. But now, here was his father’s urgent phone call, saying that the fire department papers had come through. If he was going to become a firefighter he had get home to New York by the following Saturday to be sworn in as a Probationary Firefighter with the FDNY. His father explained that this opportunity would not likely come again any time soon. He could always quit the department if he didn’t like it, his father explained. But he had to get home right away if he wanted a shot. Julius agonized for several days. 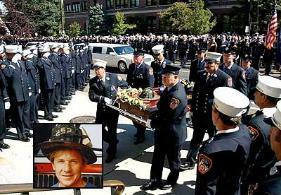 As a boy, he had idolized his father, wanting to become a fireman just as he had. But, over the years the trumpet had become his great passion, his reason for getting up in the morning. And after all, here he was in Las Vegas, playing every night, having the time of his life, and getting paid for it. How could he give this up now? Yet he realized that when this gig ended and he was back in New York again, he would be struggling for years before there would be the possibility of making regular income as a trumpet player. And he knew he wanted to start a family and buy a house. It was the great Hall of Fame baseball player and philosopher, Yogi Berra, who once said, “When you come to a fork in the road, take it!” Finally realizing that it might be possible to continue playing professionally even while serving as a New York City Firefighter, Julius made the decision to return to NYC the next day. On Saturday, April 7, 1979, Julius Pontecorvo was sworn in and became one of “New York’s Bravest;” a member of The New York City Fire Department. Over the years since that day, Julius Pontecorvo has had many duties and obligations as a member of the FDNY. His first assignment was Engine Company 247 in Brooklyn. Later, he moved to Ladder 149, also in Brooklyn. He wanted to move to a Ladder Company because he wanted to get involved with more rescue operations. Wanting to play more trumpet, and realizing the unusual hours of a regular firefighter made practicing and accepting gigs more and more difficult, he became a Fire Inspector. Fire Inspectors had regular 8 AM – 4 PM hours, so he was able to play at night whenever he got called and wanted to. The Department closed his Inspector unit after three years, at which point he went to work with Engine Company 151 in Staten Island where he stayed for another three years. And for the last two years he has been assigned to the Health and Fitness Unit, training new NYC firefighters. As Official Bugler for the FDNY, Julius has played at official functions other than funerals. He has performed The Star-Spangled Banner for events such as the important annual FDNY Medal Day Ceremony at City Hall; the FDNY Memorial Day ceremony at the beautiful and moving memorial statue to Firefighters located at Riverside Drive and 100th street in Manhattan; at various ceremonies at Fire Department Headquarters in Brooklyn, and for many VFW posts for veterans on Memorial Day each May. He also played our National Anthem accompanying his good friend, Vernon Cherry, the FDNY’s singer, at a service commemorating the infamous 23rd Street Fire of October 17, 1966. Vernon Cherry was one of the many brave firefighters who lost their lives on September 11th. Part of this nervousness was no doubt due to the very limited practice time he had during the first six weeks as a “probie;” a kind of basic training period all new firefighters must go through. “I could practice a little, but, not much. I was studying to become a firefighter. Every day getting up at 5 in the morning to train, get home at 5 or 6 in the evening, then studying until crashing into bed by 9 o’clock.” But after a while he was able to start practicing more and getting his chops back in shape. Unlike most buglers, Julius Pontecorvo has chosen to play “Taps” completely out of sight of the family and most of the other firefighters. “Years ago, at my first funerals, my Dad would play right in front of the fire truck; just in front of the casket, with the families within 20 feet. Right from the start I felt very uncomfortable playing it from this position; in front of them. We did it as a duet and it was pretty loud, we were not holding back at all. I remember thinking, gosh, I’m not sure this is a very good idea. But, you know, my Dad had twenty-something years on the job, and I’m a rookie here. So, what, I’m going to try and persuade him to change this? It was also easier on Julius, for whom the playing of “Taps” has always been an intensely emotional experience. Once, when he was playing on top of the church steps just next to the large exit doors, a mourner began crying so uncontrollably when she heard the first notes of “Taps” that she fell on top of him; pushing the trumpet right off his mouth. The accident could easily have cost him some teeth.